Me and my grandparents circa 1982. I think. When I was little my grandfather used to tell me this story of one of the first jobs he had as a kid. He would go into local stores and look for mold on all of the Table Talk pies that they were selling. His job was to take a little pocket knife and scrape the mold off of the bottom crust and place the pie back on the shelf. It was the depression and totally indicative of the times and the spirit of that era. 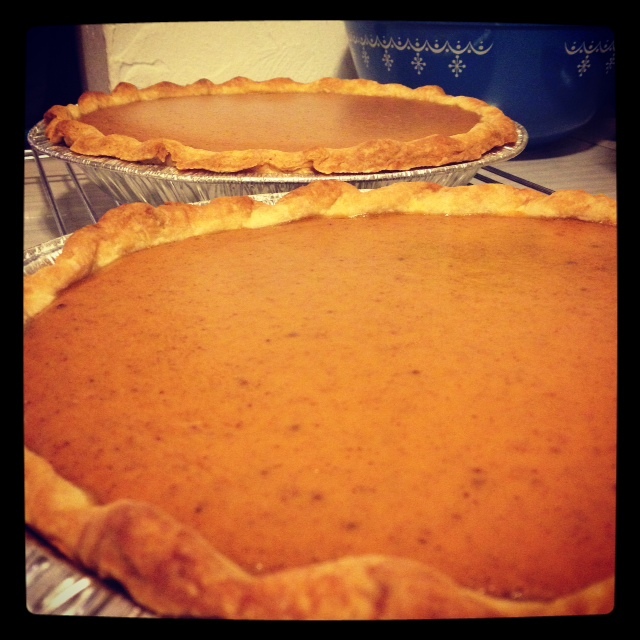 Why all this talk about pies and making pies.. well I made several different versions of pumpkin pies for Thanksgiving and wanted to share some recipes, links and love. Kate thinks I am crazy, and often calls me a baking renegade. Thanksgiving week was no different. I decided to make four pies this year, one to keep and the rest to give away. They were all pumpkin based, one traditional, a vegan option, and even a gluten-free paleo friendly option! Now you get the picture. For real. The traditional pumpkin pies were for my family and for the staff that volunteered to work Thanksgiving morning at Bloc, one of the cafes I manage. This had a buttermilk and butter crust and Kate’s Dad’s pumpkin pie filling recipe. The results… amazing! The crust was evenly browned and crisp and never got soggy even after chilling in the fridge overnight! The crust recipe is from Joy the Baker’s blog and it is her Dad’s Perfect Pie Crust recipe. I don’t want to share Denny’s exact pumpkin pie filling recipe here, so I have found a similar vintage pumpkin pie recipe that will do the trick. 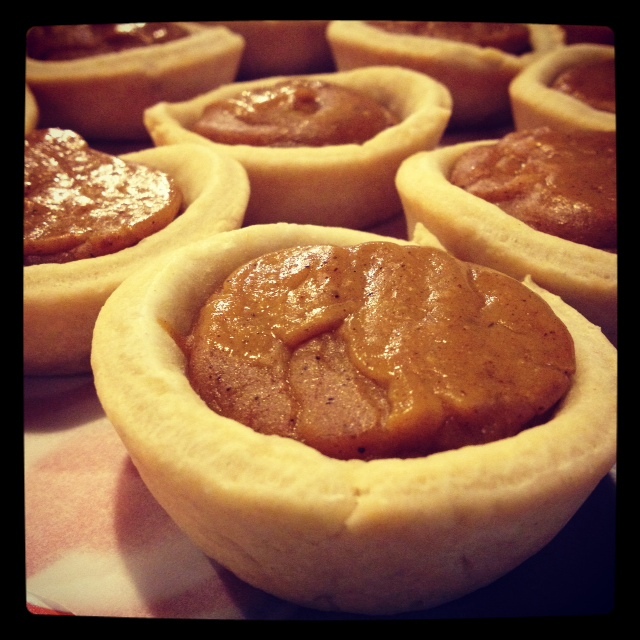 Next up…Vegan Mini Pies, delivered swiftly to the folks that volunteered to work at Diesel on Thanksgiving morning! The crust is made from coconut oil, not shortening and is soy free. It remained very light in color, but yielded a very sturdy, yet flaky crust. I found this recipe on a blog that is amazing and super cute, Loves and Lemons, it was the complete recipe, the author provided. Again, I made the crust in the food processor, no kneading or hand cutting in the fat for me! The only change I made was that I used canned coconut milk instead of almond milk in the filling, because it is what I had on hand. 4) Place pan on a baking sheet and bake crust in a 350 degree oven for 8-10 mins, check frequently you don’t want your crust to burn. You are just baking the crust enough to set it. 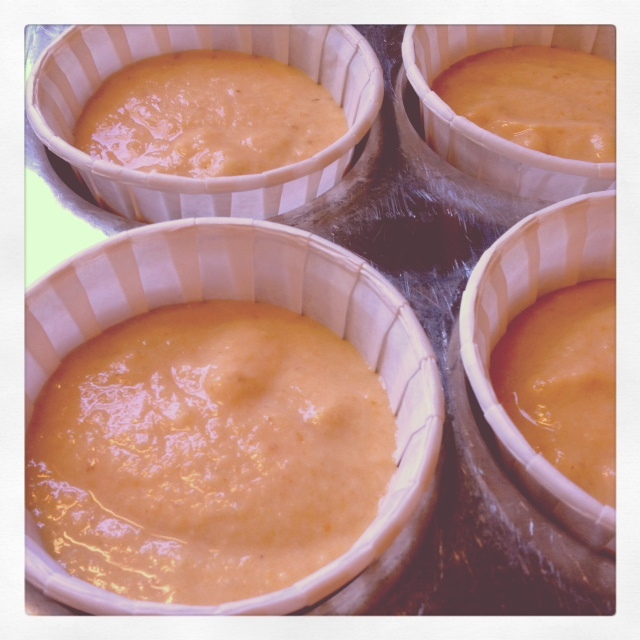 5) Cool crust completely then refrigerate while you make the cheesecake filling. – In the photo above I made coconut whipped cream, using chilled canned full fat coconut milk and powdered sugar. There you have it, our Thanksgiving recapped in pie recipes. You should try all of them, but if that is too overwhelming, just take my advice and bake at least one of the recipes above. It will be worth it. Clearly I’m obsessed with pumpkin. I’ve fallen head over heels for the flavors of Fall. Last night my friend Dillan (Instagram handle: dillandigi) posted a photo of an overnight pumpkin oatmeal he was prepping for the morning. This was the inspiration for the recipe that I’m posting here today. A few weeks ago, when Kate was traveling in Texas for work, I made myself pumpkin oatmeal in the slow cooker. It had good flavor, but it made a ton and the edges got kind of well done. So last night, I was looking online for overnight refrigerated oatmeal recipes, but decided that I might not like the texture, or that they might not be to my liking once heated up (since I didn’t want cold oatmeal this morning). Of course, typical me, I decided to wing a pumpkin oatmeal recipe this morning, inspired by this Choco-Banana-Chia Oatmeal recipe that Dillan posted on his blog in September (it’s especially tasty)! 1) Add boiling water to the oatmeal and stir. I like my oatmeal a little on the thicker side, so I also microwave the oats and boiling water for 25 seconds, then stir. 2) Add pumpkin, chia seeds, coconut oil, pumpkin pie spice and stir. 3) Top with maple syrup, a pinch of salt and dried cranberries. – Be sure to keep a close eye on your oatmeal in the microwave, if left unsupervised it can overflow & leave a mess. 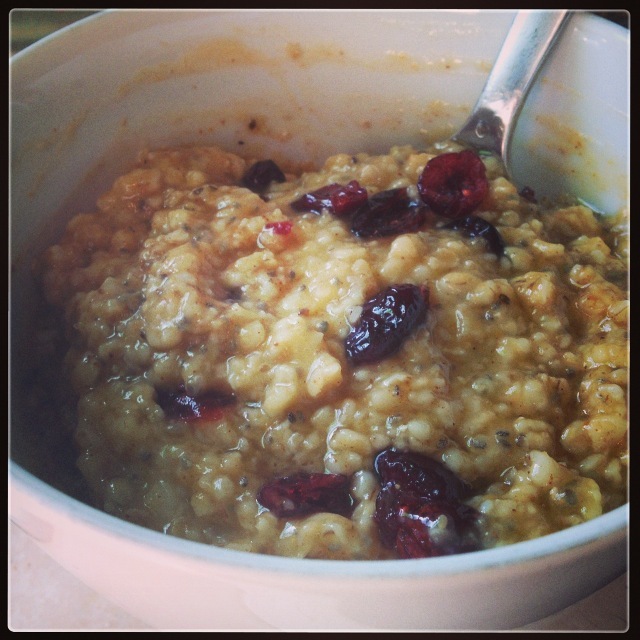 – If you like your oatmeal unsweetened, omit the maple syrup–or for a less sweet option, reduce the syrup to 1 tsp. – Feel free to use oats that are not gluten-free, the recipe would work just as well. – Other delicious toppings would include: sprouted almonds, toasted pecans, or whipped cream. There are many things that I love about Fall. It holds a certain sense of nostalgia for me, a kind of love affair and anticipation of all the things that I love. New England in the Fall all that I have ever known. Memories of being a hooded little version of myself jumping in piles of leaves and making Simon the scarecrow with my Gram. Pumpkin carving, trick or treating, celebrating all of the wonderful Fall birthdays in my family, and favorite Fall foods like acorn squash, pumpkin everything, and apple pies. As an adult, I have my own traditions built on the life that Kate and I share together. The Halloween costumes remain as well as recipes riddled with pumpkin and fall flavors. The following recipe is one that I made for the annual Diesel Halloween party, it could be made with dairy and it would be just as tasty, as always I like a baking challenge and also try to bake things that all the guests at the party can enjoy! 1) Preheat oven to 350 degrees. Line two muffin pans with cupcake wrappers. 2) In a small bowl combine the soy milk and cider vinegar and let stand for 5 minutes. This will make vegan buttermilk. 3) In a large bowl stir together the pumpkin, canola oil, sugar, vegan buttermilk, and vanilla. Sift in the flour, baking powder, baking soda, pumpkin pie spice and salt. Stir together with a fork, don’t use a mixer it will make the batter gummy. 4) Once combined fill the liners two-thirds full. Bake for 22 to 24 minutes. 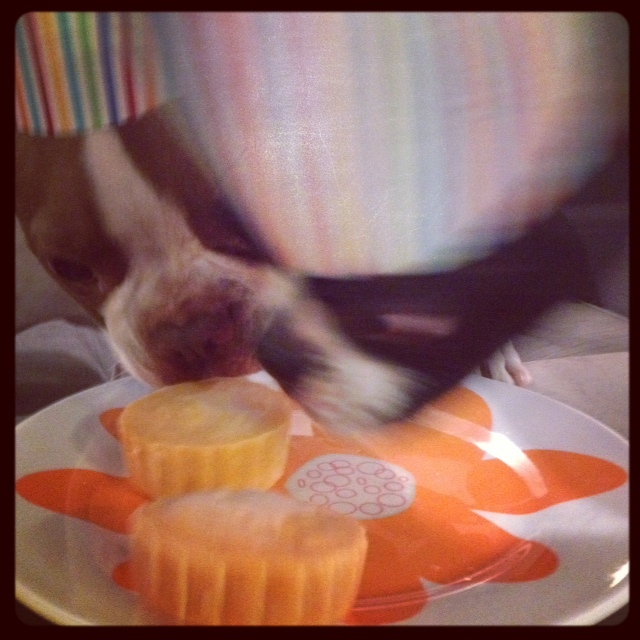 Rotate cupcake trays at approximately 14 minutes into the total baking time to ensure even baking. 5) Remove cupcakes from pans and transfer to a wire rack and let cool completely before frosting. 1) In large bowl, cream shortening and Earth Balance with electric mixer. Add vanilla. 2) Gradually add sugar, one cup at a time, beating well on medium speed. Scrape sides and bottom of bowl often. When all sugar has been mixed in, icing will appear dry. 3) Add soy milk and maple syrup, then beat at medium speed until light and fluffy. Remember to taste the frosting as you are adding the maple syrup, keep adding by the TBS until you achieve your desired taste. If the frosting appears to thick, add more soy milk, but be cautious and add a little at a time in order to not thin it out too much. 4) Once you have reached the desired consistency, then add a pinch of sea salt and beat just to incorporate. Keep bowl covered with a damp cloth until ready to use. These cupcakes were a big hit at the party. Kate said that the cake was the best pumpkin cake I’ve ever made, they were super moist and flavorful. You would never know they were vegan. Also, when dreaming up the frosting flavor, Kate doubted my decision to try a maple frosting, remarking that it might not be a flavor combo that appeals to the masses. She voted for a cinnamon buttercream, but I went with my gut and it was amazing. – This recipe could be made non-vegan by substituting butter in for Earth Balance and whole milk for the soy milk. 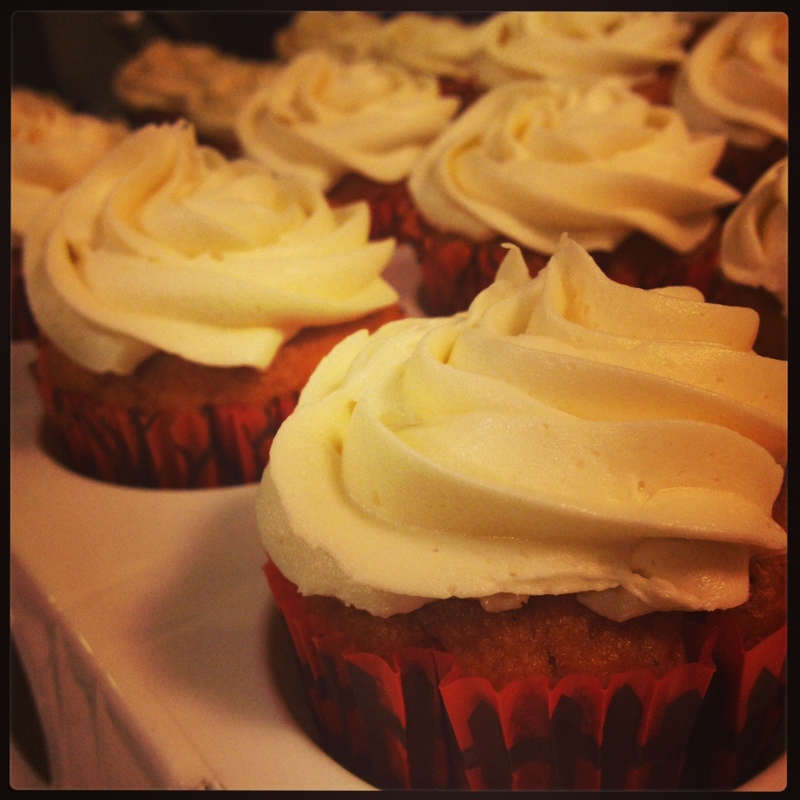 – An easy way to frost cupcakes is to fill a plastic Ziploc bag with frosting and cut one bottom corner of the bag off. Twist close the top opening of the bag and squeeze some frosting back into the bowl to remove any air pockets. Then start from the center of your cupcake and with even pressure move in a spiral until you fill the cupcake to the edge. Don’t worry if you mess up, just scrape the frosting back into the frosting bowl using a butter knife. My friend Potter, recently went for breakfast a the Neighborhood Restaurant. This is a local family owned breakfast joint located in Union Square, right down the street from Bloc 11 Cafe, where he and I both work. Potter and I share a love for all things pumpkin and he was going on and on about these pumpkin pancakes he had there, my mouth was watering just listening to him…. Bloc 11 Cafe courtyard: Scarecrows need coffee too! Of course, this lead me to an inner baking challenge, something I set myself up for on the regular,ha! I was determined to come up with delicious gluten free and/or on the healthier side pumpkin pancakes. King Arthur Flour’s gluten free pancake mix was on sale at Shaw’s, so I used this as the base for my pancake recipe. In another effort to ensure a successful gluten free recipe I researched online, but had no luck. I even posted an outcry to my foodie friends on Facebook, which yielded no recipe results… my determination grew. In true Jess fashion, as Kate would call it.. I just made my own recipe up, ad-libbed and hoped for the best. And as luck would have it, they came out perfectly! Success. 1) Measure out the milk and add the cider vinegar to it, making your own buttermilk. Let sit for 3 – 5 minutes. 2) Whisk together the egg, pumpkin, buttermilk mixture, and coconut oil. 3) Whisk in the pancake mix and pumpkin pie spice. 4) Allow the batter to sit for 10 minutes to thicken. 5) Preheat a griddle or large flat grill pan. I used our gas stove and set the burner on 6. 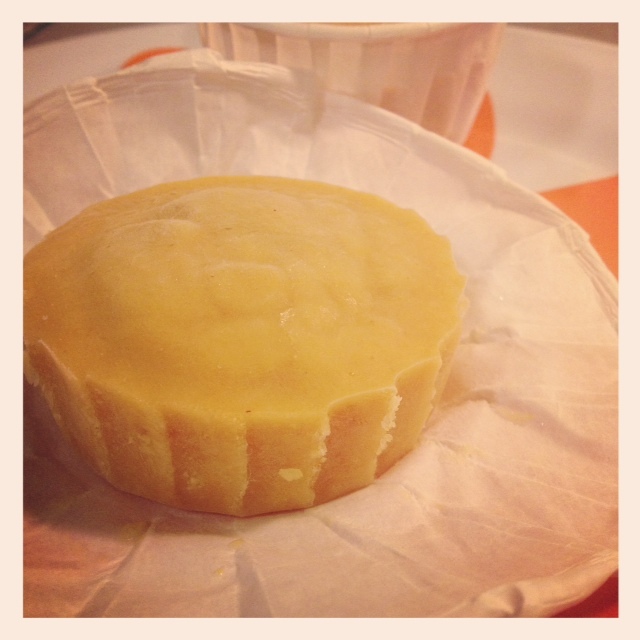 6) Grease pan with a square of organic butter. 7) Scoop the batter by the 1/4 cupful or I used a #16 dough/portion scoop onto the lightly greased pan. 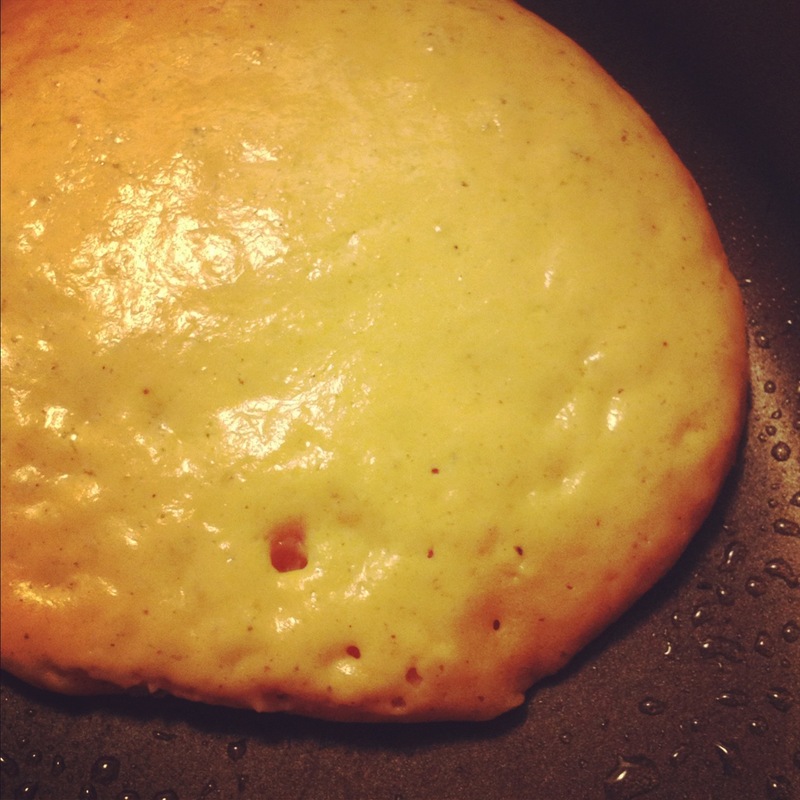 8) Cook for 1 – 2 minutes, until bubbles form on the tops of the pancakes and the bottoms are golden brown. 9) Flip and cook for 1 – 2 minutes on the other side. 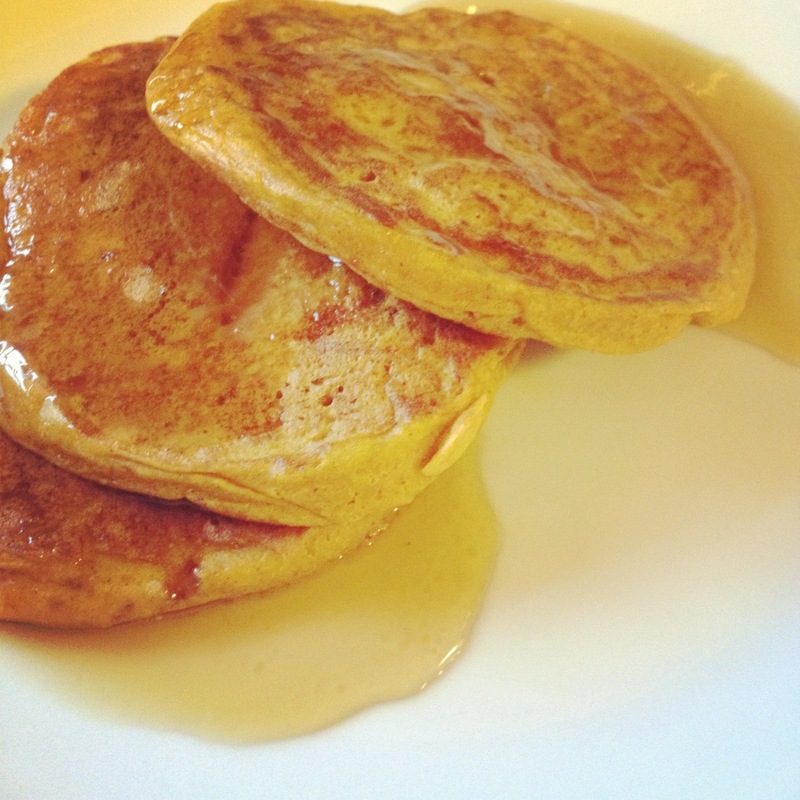 Serve hot, with organic butter and organic warm pure maple syrup. 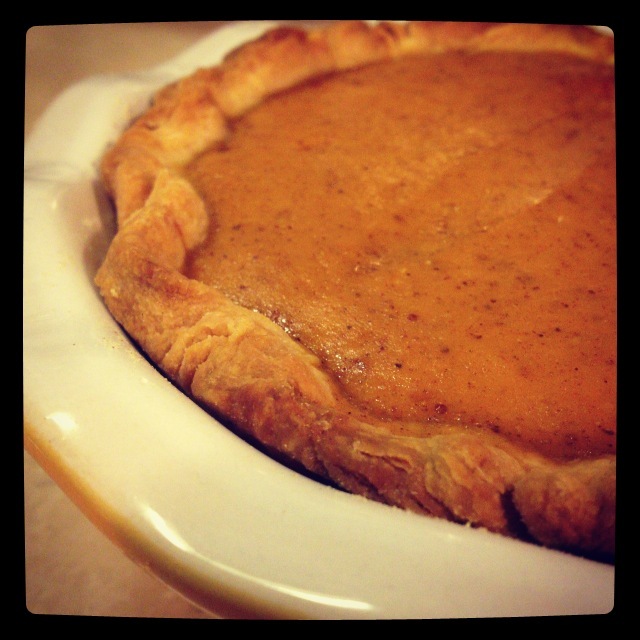 – Substitution suggestions for toppings: Maple Cream, Pumpkin Butter, or Baked Spiced Apples. Every family has their own little traditions or occasions to celebrate, ours included. 🙂 This post is a celebration of Ollie. 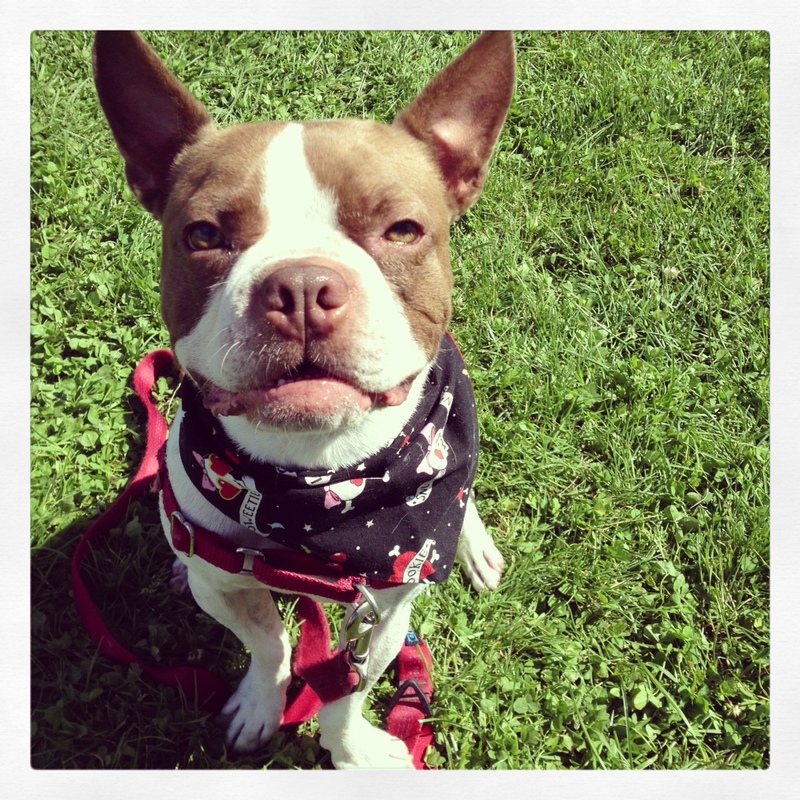 We found him on Petfinder and knew that we had to give this little brown Boston Terrier, a puppy mill survivor, a proper home. A home where he always has a toy to comfort him, a brother to play with, homemade treats to snack on, and someone to cuddle. My favorite memory from the first week Ollie lived with us, happened at my parents’ house, my childhood home, in Dracut, MA. It was my Aunt’s 60th birthday and the family had decided to go out to lunch and then have cake and ice cream back at my parents’ house. After lunch, Kate and I made sure we were the first to arrive back at the house. Then Auntie came in and called out for Stevie “Where’s my Stevie?” “Come and see your Auntie!” All of a sudden, to her surprise, this tiny little white flash came running down the hallway! 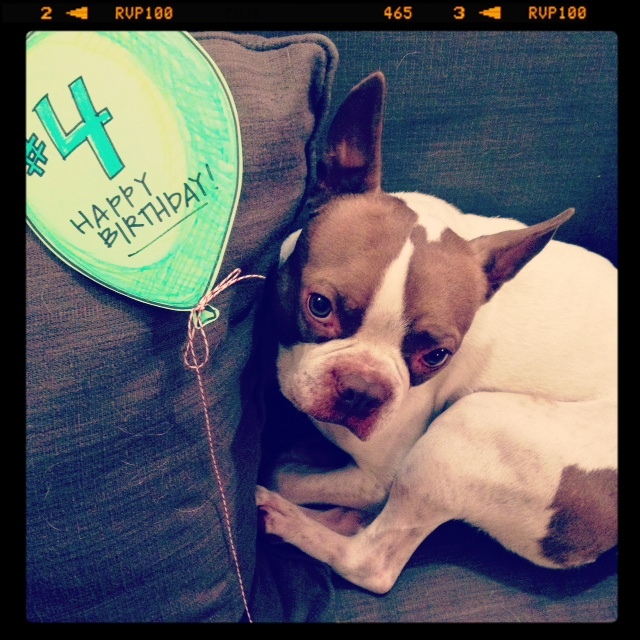 She had the biggest smile and greatest birthday surprise — puppy love from the newest member of our family! In honor of Ollie’s adoption anniversary we took him to the Somerville Dog Festival in our neighborhood on a recent Sunday afternoon. 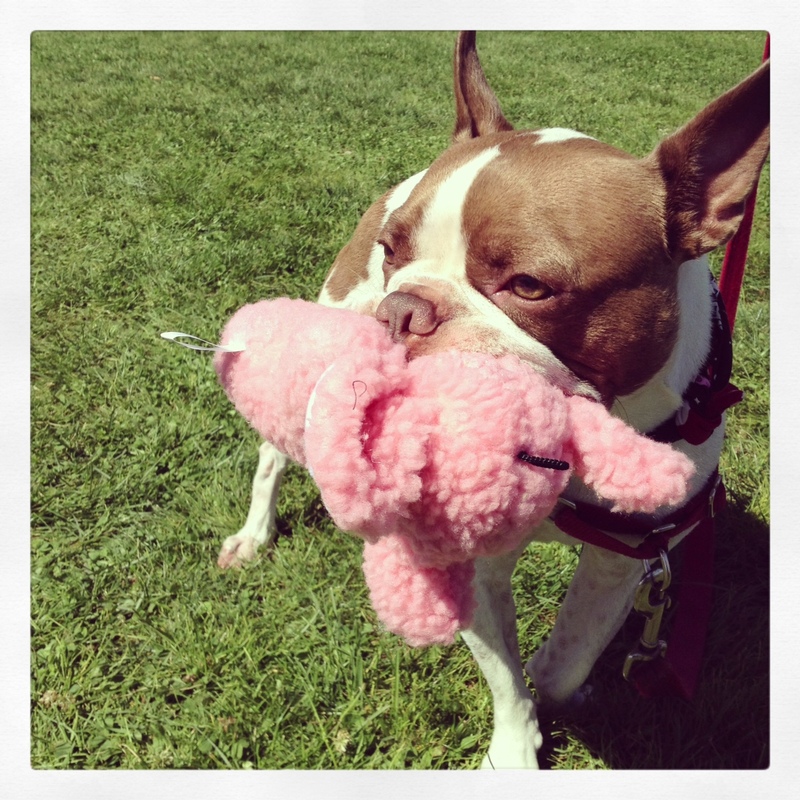 A field full of games to play, prizes to win and free treats to sample… any dog’s dream. 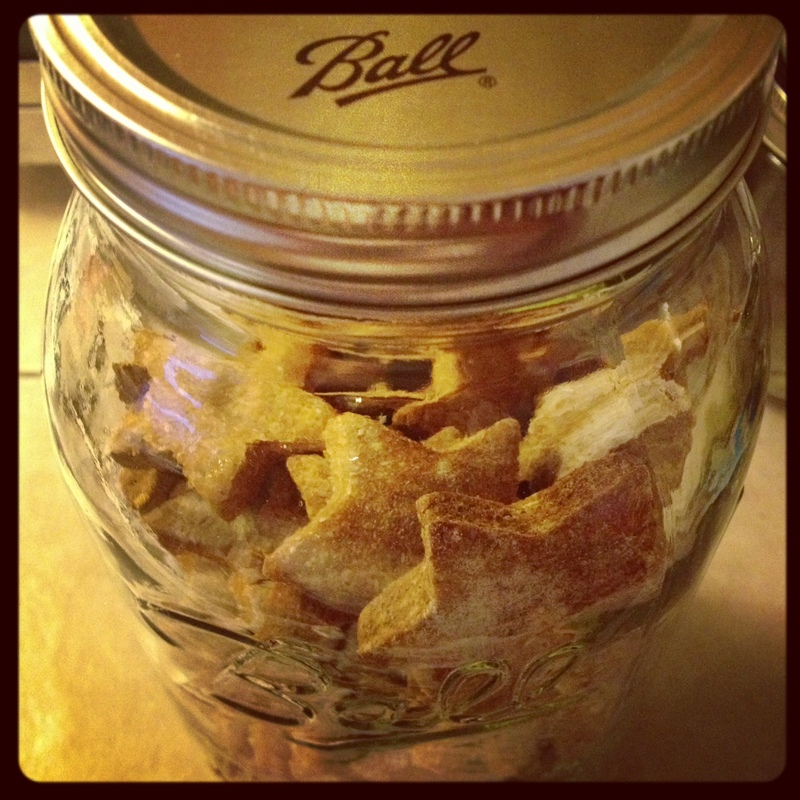 Followed up by some homemade dog treats for the boys to enjoy. Yay! Happy baking! 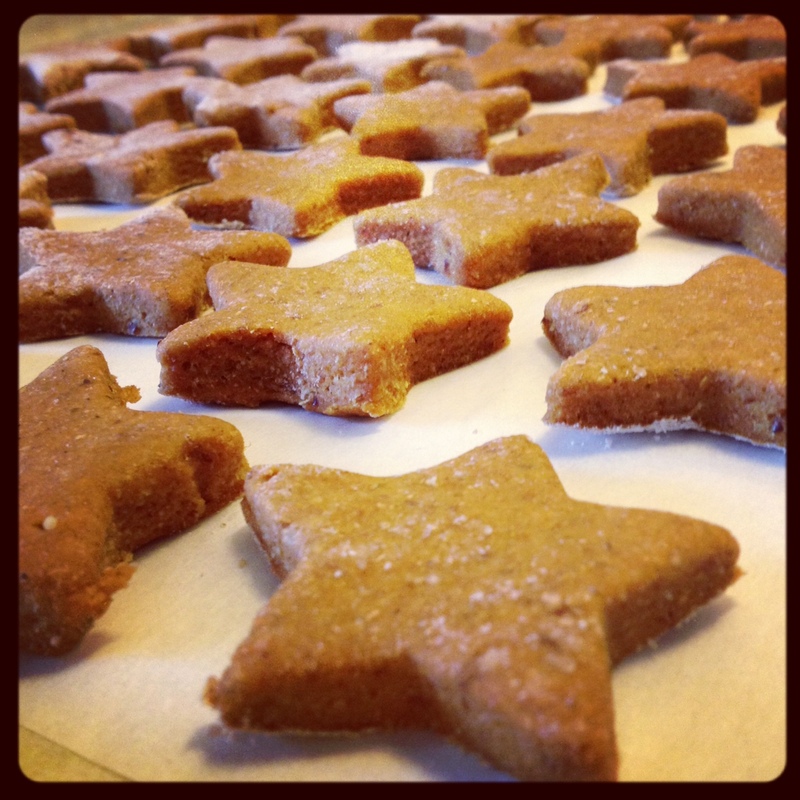 Enjoy the recipe — I’m sure your pups will! Below is a photo of Ollie with the prize he won at the Somerville Dog Festival. He carried all around the festival and all the way home on our walk. What a character! We had some leftover buttermilk (from the best yellow cake recipe I’ve ever made….a future post, so stay tuned!) that screamed “Oh hi, PANCAKE opportunity!” to me as I headed into the refrigerator to get fixings for my weekend coffee. So I made these amazing pancakes from Heather Cristo’s blog. Um, who can resist a recipe that has the word “best” in it? Clearly not me! Verdict: They were really yummy! I’ve included some notes about the recipe, etc. below. 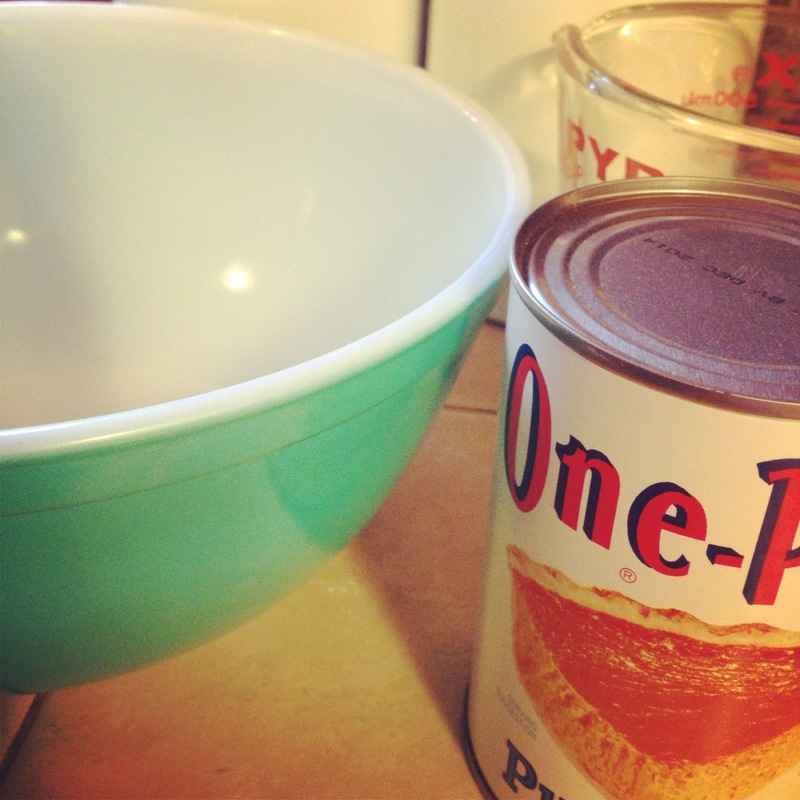 Recipe | I added a 1/4 tsp of pumpkin pie spice to the batter (because we had it on hand). 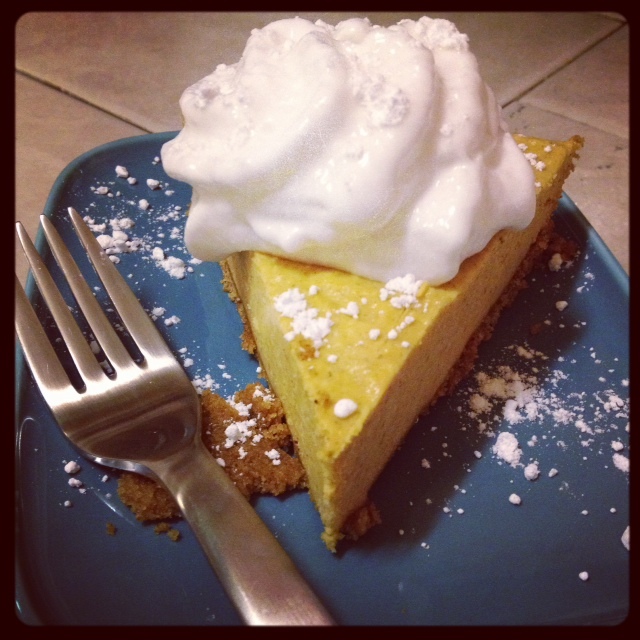 I was hesitant to add more because I didn’t it to overwhelm the yummy pumpkiny goodness. It added a subtle spice & depth of flavor. Add more if you want to really taste it. I love a salty pancake and don’t usually add much (if any) sugar to things that I’m going to drizzle with maple syrup. That said, these were a little too salty. If I made these again, I’d cut back on the salt (to 1/2 tsp) and add a tablespoon of sugar (raw, white, brown, light brown…whatever we happened to have in the pantry). These would be really easy to make vegan by making your own “buttermilk” (using soy milk adding lemon juice or vinegar) and adding a butter substitute for the butter. Cooking | I cooked all of them before we sat down to eat, keeping them warm on a low temp in the oven on a cookie sheet lined with parchment. Leftovers | I wrapped up the leftover pancakes and tossed them in the refrigerator. We heated a couple of them in the toaster (Jess’s brilliance!) the next day & had them with a cup of tea as we stayed safe inside while hurricane Sandy danced with the power lines outside our house. 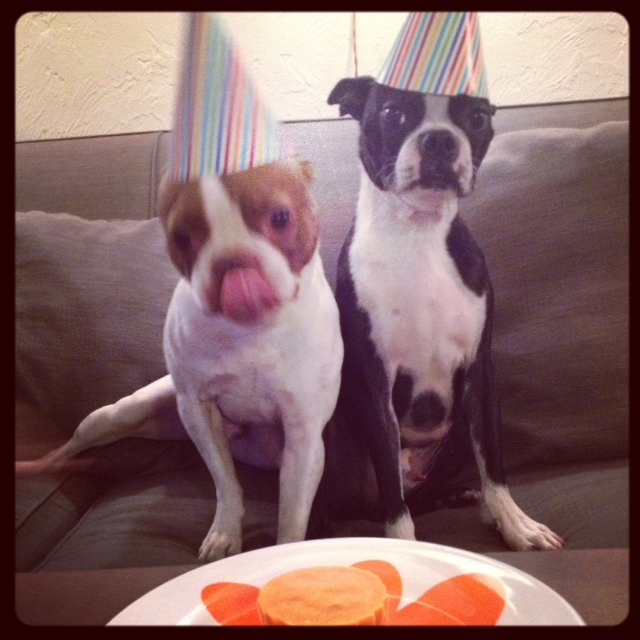 If you have pups, here’s a great use for the leftover pumpkin! Mix a tablespoon of pumpkin in with their food. They’ll love it and it’s great for their digestive health — it magically helps with diarrhea or constipation. Just make sure it’s the same kind of pumpkin you’ll have leftover from this recipe — canned plain pumpkin (not the pumpkin pie filling kind with added sugar & spices).